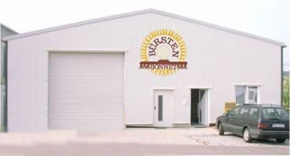 The company BÜRSTEN-BONNET was founded in 1953 by Fritz Bonnet. Our chief business during the initial years was manufacturing brooms and brushes for cleaning industrial plants. The new demands continually appearing as a result of the rapidly progressing technical developments and rationalisation also led to changing customer requirements. So we continually adapted our range of products according to the market needs. Our range of products was extended in particular to include technical brushes for operation in machines. However, for this purpose it was necessary to develop and manufacture the brush body under our own control, so today we are also able to manu- facture special articles in small batches for attractive prices. The continually increasing requirements on the food industry hygiene sector entailed a further extension of our production. BÜRSTEN-BONNET offers a complete range of cleaning products for the modern hygiene sector, including pipe brushes with stainless steel wire core. Utilising the latest technology, we are able to manufacture keenly prices precision articles just-in-time . Although we work with the latest CNC computers, we still attach great importance to the craft skills of our personnel. The traditional manual draw-in technique remains an important aspect for manufacturing our high quality products. The right feel and a trained eye ensure best quality. Our experience of more than 50 years in manufacturing brushes always stands behind our advisory service in consultations with our customers to solve their particular problems.